Gladhair : Hello, we are Ivan and Natalia. GladHair.com is our family business, it is not a huge corporation, that's why you get the best prices and customer service. Natalia is a creative person who loves hair accessories and Ivan loves to make websites, so we decided to create the best online place to shop for hair accessories. 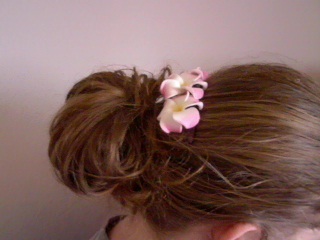 Natalia was sweet enough to send me this Hawaiian Flower on Tortoise Comb from Gladhair. The beautiful flowers on this come are white, yellow, and pink. Perfect for summer time florals, and summer time colors. I love companys that package their products with love such as Cute boxes, bows, and such as my flower comb in this adorable hot pink tie bag. 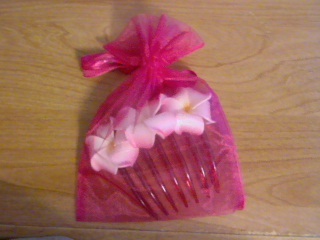 I was able to use this flower comb in so many ways. 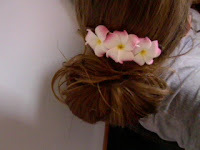 I did it in a half up, hair all the way down, i did it in a side bun, and as this picture displays a back bun. Each way was glam with this beautiful flower comb, The comb kept my hair in place, the comb did not budge, did not slip, or pinch my head. It stayed in place secure. I forgot it was even in my hair untill I took it out. The comb claw is a light brown color so it blended into my hair nicely once I got it into my hair I couldn't even notice that it was a comb, All I seen was the beautiful flowers. The claw is made from plastic but not cheap plastic the claw is heavy duty made and won't break easily in your hair like other combs have when I tried to place them in my thick head of hair. 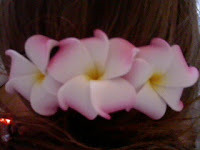 The flowers are made of a soft foam, Soft to touch, and was not too big. The colors were bold but not overwhelming unlike other fake flower hair products I have had in the past.